by some awesome fan and guest of The L Chat board. Haha! Nice idea that KILL RONNIE poster! 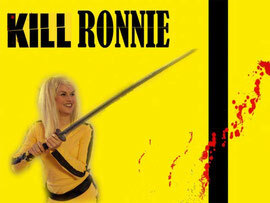 :D I want that to be KILL BILL 3 directed by Tarantino!! And I want Jenny to use the five point palm exploding heart technique on Ronnie! This is the first time I'm not looking forward to an Emma scene. Logically, wouldn't it make more sense to expell Ronnie from the school? He openly deals drugs at school, he's attacked students, made threats... ugh I hope Jenny pulls a Kill Bill on him. No me gusta :( The five-point exploding heart is too good for Ronnie. There needs to be serious pain and so much blood that the picture goes black & white. Jajaja that poster is hilarious!! I agree with che, Jenny will come to rescue Emma from those guys!!! I loved the STAG's performance... and even more Emma's voice, I think its getting better every time!! And Caro... I don't like Caro's voice, not at all!!! I think the problem with Caro is that she has a VERY heavy accent when she sings in English. 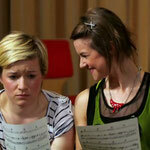 I have a suspicion that the actress for Caro was never expected to join STAG. All the others were chosen for their singing as well as their acting, but in Caro's case I expect the story line went in an unexpected direction and they were just fortunate that she can sing quite well, though with a strong accent. Caro probably ended up more popular than they expected. Maybe the translator isn't the only one trying to pair her off with Luzi?